This chapter deals with American history from 1800-1840. It comprises what are referred to as the Jeffersonian and Jacksonian ages. Because of continuing strife in Europe, the administrations of Jefferson and his successor James Madison were still dominated by foreign affairs. The War of 1812, however, coincided with the final years of the Napoleonic wars; Napoleon’s defeat at Waterloo in 1815 came just six months after the War of 1812 was concluded. From then until the 1840s domestic issues predominated. Review. The election of 1800 is noteworthy for the peaceful transition of government leadership from one political party to its opposition, demonstrating that such a process could be accomplished without widespread confusion, villainy, or violence. Throughout history, governments (kings, autocrats, emperors) had rarely been replaced, except by death and inherited succession, without bloodshed or war. This peaceful transition at the dawn of republican ideas ushered in a new century in appropriate style. President Thomas Jefferson sought to unite the nation in his inaugural address by stressing the republican values shared by members of both parties. The election of 1800 is one of the most important in our history because the transfer of power from Federalists to Republicans was achieved peacefully, but it was not without controversy. Republicans Thomas Jefferson and Aaron Burr challenged Adams and Charles Cotesworth Pinckney for the White House in 1800. The Federalists had a number of strikes against them including the Alien and Sedition Acts, the taxes raised to support an undesirably large army, suppression of the Whiskey Rebellion, and Jay’s Treaty. Jefferson was nominated for president, and Burr for Vice president. When the final results were tallied, Jefferson and Burr each had seventy-three electoral votes. Thus control of the republic changed hands. The Federalists lost office in 1800 partly as a result of internal party disputes, but more importantly, because they lost touch with American public opinion. The Federalists also lost the election of 1800 because they were internally divided, a condition resulting from differences between the Hamiltonian “high Federalists” and supporters of John Adams. The Republicans won easily, but now they would have the responsibility to govern, and as many subsequent parties and candidates have discovered, it is one thing to win an election, quite another to govern effectively. For a time, at least, the Republicans would have it their way. In his first inaugural address Jefferson laid down his political philosophy in his own words, written in his own hand. There were no “speechwriters” in Jefferson’s time. The following excerpts from Jefferson’s first inaugural capture not only his thinking, but they represent a near perfect embodiment of the ideals of the Enlightenment, of which he was a product. Equal and exact justice to all men …; peace, commerce, and honest friendship, with all nations—entangling alliances with none; the support of the state governments in all their rights, …; the preservation of the general government in its whole constitutional vigor, as the sheet anchor of our peace at home and safety abroad; a jealous care of the right of election by the people; absolute acquiescence in the decisions of the majority …; a well-disciplined militia—our best reliance in peace and for the first moments of war, till regulars may relieve them; the supremacy of the civil over the military authority; economy in the public expense, … ; the honest payment of our debts and sacred preservation of the public faith; encouragement of agriculture, and of commerce as its handmaid; … freedom of religion; freedom of the press; freedom of person under the protection of the habeas corpus; and trial by juries impartially selected. Also in keeping with his idea of minimal government Jefferson asked Congress to repeal the federal excise taxes on whiskey and cut military spending. His attitude toward military matters bordered on pacifism (he had not fought during the Revolution) and he has been criticized for allowing the U.S. military to slip to the point where the country could scarcely defend its own national waters. This weak military establishment invited abuse of America’s rights as a neutral nation as the European powers waged terrible wars. His purpose was a frugal government, an admirable goal, but some saw the reduction of military expenditures as dangerous. Jefferson regarded a large federal deficit (debt) as dangerous to republican government. He viewed large military expenditures as dangerous and likely to provoke hostilities. He cut federal expenses, mostly through reductions in military spending. Reduction of the army had the further benefit of removing a threat to Republican government, as he saw it; standing armies were still very unpopular. He saw the repeal of the whiskey taxes by Congress as a way of reducing the hand of government on the people. Jefferson was hounded by Republicans for political offices, but he gave jobs only to those he thought competent, no matter what their party. He did not fire Federalists because of their party affiliation, but many retired. Some, who saw where things were going politically, like John Quincy Adams, became Republicans. Jefferson called the election a “revolution” because power changed hands with no bloodshed. Although it was not considered proper to “run” openly, Jefferson worked hard behind the scenes to get elected. The Federalists linked Jefferson to France, challenging his early support for the French Revolution, which by 1800 had a legacy of violent excess. A peculiarity existed in the Electoral College in that there was no distinction between presidential and vice-presidential electors: The resulting tie between Jefferson and Burr sent the election into the House. The Twelfth Amendment corrected the problem, and only one subsequent election was decided by the House of Representatives, the election of 1824. The Federalist contribution: The Federalists were out of power, but they had created a new Constitution and worked hard to get it ratified, a considerable feat. We are all Republicans, we are all Federalists. If there be any among us who would wish to dissolve this Union or to change its republican form, let them stand undisturbed as monuments of the safety with which error of opinion may be tolerated where reason is left free to combat it. I know, indeed, that some honest men fear that a republican government can not be strong, that this Government is not strong enough; but would the honest patriot, in the full tide of successful experiment, abandon a government which has so far kept us free and firm on the theoretic and visionary fear that this Government, the world’s best hope, may by possibility want energy to preserve itself? I trust not. I believe this, on the contrary, the strongest Government on earth. The Federalists put the nation’s financial house in order. The Federalists resolved significant diplomatic issues with Spain, France and England and postponed armed conflict until the nation was stronger. Once the Federalist Party had disappeared, having been discredited by its opposition to the War of 1812, America became for a time essentially a one-party system. James Monroe ran unopposed for president in 1820. Some politicians at that time began referring to themselves as National Democrats, but there was really only one party. Nevertheless, the country was divided by many political issues which we will discuss below. By 1824 political divisions had begun to reappear in the country. Well before that election took place, five potential presidential candidates had emerged. In the end, John Quincy Adams became president. That controversial election was the last one ever decided in the House of Representatives. By 1828 a new political coalition had begun to form out of the old Democratic Republican party, but this time they were referred to as Democrats. Their leader was Andrew Jackson, who defeated John Quincy Adams in 1828. Jackson’s administration began without organized political opposition. Remnants of the old Federalist Party, along with Adams supporters, generally men of a more conservative persuasion, began to call themselves National Republicans. They never coalesced into a formal party, however. Jackson’s resounding victory in 1832 and his defiance of congressional opponents led to the creation of a new political party, the anti-Jacksonians. They called themselves Whigs, a name traditionally used by political groups opposed to autocratic rule. The Whig Party survived until the 1850s, when it broke up over the slavery issue. Many of the issues that divided the Democrats and Whigs during these years, such as the National Bank and protective tariffs, came to a head during the Jackson administration. Jackson’s successor, President Martin Van Buren, a Democrat, was defeated by the Whig candidate William Henry Harrison in 1840. By 1840 the country had changed a great deal. Voting privileges had been extended to virtually all adult white males, and organized political parties began to field candidates for president and vice president on a single slate. The European world was in a period of relative calm, and America was able to develop internally without significant interference from overseas. As the country grew and expanded, domestic politics were typically rough-and-tumble, but lurking barely below the surface of the nation was the institution of slavery, which was dividing the country ever more sharply along sectional lines. Thomas Jefferson: Founding Father. Jefferson's politics were clearly liberal, according to the meaning of the term in that age, and so were Jackson's. But Jefferson's politics had a sort of elitist overtone. He believed that while republican principles would guide the nation's course, men of superior ability and talent would naturally rise to the surface and become the leaders—a “natural aristocracy” in Jefferson’s terms. (Thomas Jefferson to John Adams, 28 Oct. 1813, Adams-Jefferson Letters, ed. Lester J. Cappon, Chapel Hill: Univ. of North Carolina Press, 1988, 388.) The age of Jackson, on the other hand, is known as the age of the common man. That belief was symbolized by Jackson himself, who rose from very humble beginnings to the highest office in the land. It is during the age of Jackson that we will see modern ideas of democracy begin to emerge. Thomas Jefferson is claimed with some justification as a political icon by both liberals and conservatives in modern times, for there were elements of his political philosophy that are consistent with the beliefs of both groups. Yet Jefferson's positions must be viewed both in the context of his own times and in the context of the changes that have occurred over the course of American history. The forces that affect our “pursuit of happiness” have evolved; so must our understanding of Jefferson’s idea of the proper role of government in American society. Had Jefferson, for example, foreseen the power of the “robber barons” of the late 19th century, he might have viewed government very differently. Because politics were often so bitter in early America, they frequently became personal. Jefferson’s greatest political rival was Alexander Hamilton. Jefferson opposed the kind of centralization that Hamilton advocated, and he had strongly disagreed with Hamilton’s reasoning in the creation of a national bank. Their mutual animosity was personal as well. Jefferson also found himself at odds with George Washington, whom he believed had been duped by Hamilton into following unfortunate policies. He also parted ways with his close friend John Adams, even while serving as Adams’s Vice President. One sad outcome of the political bitterness of the 1790s was the rupture of the friendship between those two giants. Fortunately for posterity, Adams and Jefferson were later reunited in correspondence through the intercession of their mutual friend, Dr. Benjamin Rush, and spent their latter years writing each other about a wide variety of topics. Very little of their correspondence involved past issues. One fascinating letter exchange, however, took place between Abigail Adams and Thomas Jefferson. She sent condolences to Jefferson upon the death of his daughter in 1808. Jefferson’s response went beyond thanking her, however, and drifted into his disagreements with John Adams. Abigail joined the debate with vigor, and their exchange lasted several months. John Adams knew nothing of it until the end. Thomas Jefferson and John Adams died on the same day—July 4, 1826. Adams’s last words have been widely quoted as, “Thomas Jefferson survives,” but his friend had died hours earlier. Another aspect of Jefferson's life which has gotten much attention is the relationship between him and Sally Hemings, a slave who belonged to him. Known for her beauty, Sally was Thomas Jefferson's wife's half sister. It now seems virtually certain that Jefferson fathered at least one child by Sally Hemings; recent DNA tests connect Jefferson and Hemings though their descendant, Madison Hemings. Until this mystery was unraveled by modern science, the Jefferson-Hemings affair was a lesson in historiography, for with one set of available evidence, reputable historians came to opposite and mutually exclusive conclusions. The lesson is that honest men and women can disagree even when agreeing on the facts. Further, our own feelings and biases can affect the way we interpret history. The most exhaustive work on the subject prior to the DNA discoveries was the book by Annette Gordon-Reed, “Thomas Jefferson and Sally Hemings: An American Controversy.” Gordon-Reed, a law professor, examined the evidence in detail and concluded that it was impossible to know for sure what the Jefferson-Hemings relationship was. Gordon-Reed was bothered by the fact that evidence offered by Madison Hemings, who claimed to be a descendant of Jefferson and Sally Hemings, was discounted because he was African American. Many admirers of Jefferson are distressed over this entire issue and would prefer not even to have it mentioned. Does that say more about Jefferson, about us, or about the different time in which Jefferson lived? 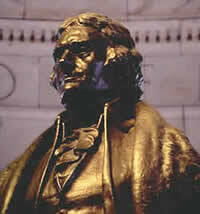 Jefferson is claimed by both left and right, he remains elusive and controversial. Personally he was a shy and introspective man. He was a brilliant thinker, in office capable and pragmatic, but he was not a great president. Jefferson personified the contradictions in republicanism: He despised ceremonies and formality and dedicated himself to intellectual pursuits. Still, he was a politician—he realized that his success as president would depend on cooperation with Congress. His public life was characterized by conflict with Hamilton, Adams and even Washington from time to time. His most enduring political friendship was probably with James Madison, who moved from the Federalist camp to become a stalwart of Jeffersonian democracy and the Democratic-Republican Party. 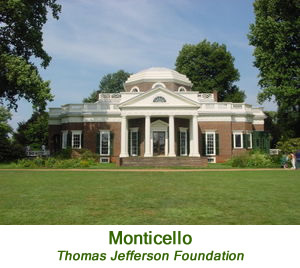 Jefferson spent almost his entire life in significant debt, partially caused by others, but also brought on by his taste for furnishings, books, wine and other fineries, as well as his lavish spending on Monticello. He was unable to make a stable income from farming. Jefferson loved music, education learning; he collected books—after the War of 1812 his library became the core of the Library of Congress. He held a strong belief in a free press, freedom of religion and speech. Jefferson did not like pomposity, formality, or aristocratic pretensions. He supported the yeoman farmer, who he felt he was the salt of the earth, and did not want America to become a nation of “mechanics” (laborers.) He also did not trust judges, bankers, or merchants—and he disliked urban life. Although at that time it was considered ungentlemanly to “run” openly for public office, Jefferson worked hard behind the scenes to get elected in 1800. Jefferson was an early advocate of government supported education, as he showed in the land ordinances of the 1780s, parts of which he authored. John Marshall is judged by lawyers and historians to be the greatest Chief Justice in the history of the Supreme Court. He may also be the most unappreciated and neglected figure in American history, for the imprint he left on our nation and government was enormous, yet he is not well known. After years of public service in various capacities, including military duty under George Washington during the Revolution, and a distinguished legal career, Marshall was appointed Chief Justice by President John Adams in one of his final acts before leaving office. Marshall was a Federalist who brought his attitudes of political nationalism to the bench. Yet within a few years of his appointment, most of the Federalist judges on the court had been replaced by Republicans appointed by Jefferson or Madison. The decisions that Marshall wrote were, nevertheless, all unanimous or nearly so, a tribute to Marshall’s astute legal reasoning, his persuasiveness and his leadership of the Court. Appointed by Adams in 1801, Marshall served as Chief Justice of the United States through almost nine presidential terms—Jefferson through Jackson. When Marshall died in 1835, John Quincy Adams said that Marshall’s appointment was his father’s greatest gift to the nation. John Adams himself had called the appointment his proudest act. Jefferson had little use for courts in general or for John Marshall in particular. (There may have been personal animosity between the two men, who were distantly related, that had nothing to do with politics. See Jean Edward Smith, John Marshall: Definer of a Nation, New York: Holt, 1996, 11.) In any case Jefferson went to his grave calling Marshall a detriment to American government. The two great men were at their worst when confronting each other. It began with the case of Marbury v. Madison. William Marbury, appointed by John Adams as Justice of the Peace for the District of Columbia, was one of the “midnight judges,” so called because they were appointed by Adams at the last minute under the Judiciary Act of 1801. When Jefferson became president he discovered that Marbury had not received his warrant, ironically because of an oversight by Marshall, who had been acting Secretary of State before becoming Chief Justice. Under the 1789 Judiciary Act, judges could sue for writs of mandamus—in this case getting the court to order the warrant delivered. Marbury sued for his warrant, but Jefferson ordered Secretary of State Madison not to deliver it. The case eventually made its way to the Marshall Court. Marshall was in a tight spot. By now it was clear that Jefferson wanted to keep the courts, including the Supreme Court, weak. If Marshall ordered Madison to deliver Marbury’s warrant and Madison (as directed by Jefferson) refused, there was little Marshall could do, and the Court would be further weakened. There was no constitutional means for the Court to enforce its own rulings in the face of presidential defiance. Captain Lewis and Lieutenant William Clark set out within weeks. Lewis and Clark led their party of about 40 soldiers across the continent in a two-year journey. They were guided by French-Canadian fur trapper named Toussaint Charbonneau and his Shoshone wife, Sacajawea, who also acted as translator in the party’s dealing with Indian tribes. They built Ft. Mandan in the Dakota Territory, where they spent the first winter, and eventually reached the Oregon coast. In the spring of 1805 they sent samples of wildlife back to Jefferson, including a live prairie dog. In addition to providing detailed information about the newly acquired western regions, their travels also gave America claim to the Oregon Territory; it would be decades before those rights were assured. Jefferson also sent Zebulon Pike on a similar mission. Pike helped establish the notion of the Great Plains as the “Great American Desert.” He also explored the Colorado Rockies and discovered the peak named for him. 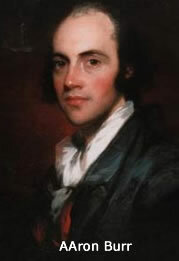 In 1805 Aaron Burr stepped down as vice president of the United States. As mentioned above, he had challenged Jefferson for the presidency in the election of 1800, even though he had been nominated for vice president. 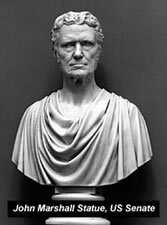 Burr had conducted himself as president of the Senate quite ably; he presided over the impeachment trial of Justice Samuel Chase with rigorous fairness. Although Jefferson never referred to Burr’s conduct in the election of 1800, it was clear that he did not trust his vice president. Burr ran for governor of New York in 1804 and lost. He blamed the loss on political enemies, including Alexander Hamilton. When Hamilton made what Burr considered derogatory remarks about him at a dinner, the two antagonists sent notes to each other and eventually fought a duel. 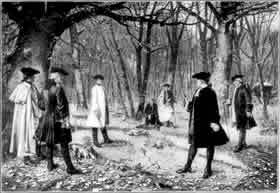 As dueling was illegal and punishable by death in New York, the two crossed the Hudson River to New Jersey, where Burr fatally wounded Hamilton on in July 11,1804. It remains the most famous duel in American history. Burr was charged with murder in New York and New Jersey, though he was never tried in either jurisdiction. He fled to South Carolina, where his daughter lived, and eventually returned to Washington to complete his term as vice president. After leaving office in 1805, he embarked on an enterprise that eventually led to his being charged and tried for treason. Burr began corresponding with one General James Wilkinson concerning an apparent plan for the conquest of Mexico. Although the full nature of Burr’s intentions remained unclear, it was rumored that he planned a rebellion to separate the Western parts of America from the nation and create an empire which he would control. He was clearly engaged in some sort of conspiracy, even though details remain murky. Burr was eventually arrested, charged with treason against the United States, and brought to Richmond, Virginia, for trial. Before the trial began President Jefferson openly expressed his opinion that Burr was guilty of treason. Chief Justice Marshall, however, presiding over the trial, followed the strict construction of the definition of treason in the Constitution. Article III, Section 3, states: “No person shall be convicted of Treason unless on the Testimony of two Witnesses to the same overt Act, or on Confession in open Court.” In Marshall’s opinion, the evidence provided by the prosecution failed to rise to that standard. Aaron Burr was thus acquitted, which widened and made permanent the rift between Jefferson and Marshall. Thus ended the public career of Aaron Burr, a man who fell out of grace, and whose behavior “filled many of his fellow ‘great men’ with horror.” (See Gordon Wood, Revolutionary Characters: What Made the Founders Different, New York, 2006, especially “The Real Treason Trial of Aaron Burr,”223-242. Burr's many admirable qualities were outweighed by his overweening ambition. Jefferson's presidency, like those of Washington and Adams, was dominated by foreign affairs issues because of the wars resulting of the French Revolution. By the time Jefferson became president, Napoleon had risen to power in France and had embarked upon the creation of a worldwide empire. Secretary of State James Madison had long believed that the strength of American commerce could be an influential factor in European affairs. Both he and Jefferson believed that the United States could play Great Britain off against France in order to further their own goals. Napoleon, on the other hand, saw North America and the Caribbean as potential areas he could use in order to develop French power. The Mississippi River, along with the Ohio and Tennessee, which fed into it, had been seen since the 1780s as perhaps the most important communication avenue in the young nation, at least for the states and territories west of the Appalachians. The key to the commercial use of the Mississippi was New Orleans. Pinckney’s Treaty of 1795 (the Treaty of San Lorenzo) had established the right of deposit in New Orleans. When the Louisiana territory was later ceded to France in the secret Treaty of San Ildefonso in 1800, America's rights were not transferred. efferson did not formally learn of the transfer of power until 1803, although he had been getting secret intelligence concerning Napoleon’s intentions in North America from friends in France. Napoleon, meanwhile, had been planning to colonize the Louisiana territory. He would use slaves from Haiti to establish an agricultural venture to support his plans for further conquest. A slave revolt in Haiti led by Toussaint L'Overture, however, upset Napoleon’s plans, and he stunned the Americans by offering them the whole Louisiana Territory. Livingston and Monroe had been authorized to purchase only New Orleans; fearing that Napoleon might rescind the offer, however, they agreed to purchase the entire region for $15 million. Although the Louisiana Purchase was one of the greatest real estate bargains in history, a surprising amount of opposition arose to the treaty. New England-based Federalists feared that adding more territory in the West would reduce their political influence relative to the rest of the nation. The proposed purchase raised a Constitutional question in Jefferson's mind, but he was persuaded to put aside scruple and grab the bargain—over 800,000 square miles at about three cents an acre. The exact boundaries were not clearly delineated, which led to a later controversy with Spain. The purchase, however, doubled the size of the United States. Prior to the American Revolution, Great Britain had for years been paying tribute to the North African nations of Algiers, Tunis, Morocco and Tripoli, an area known as the Barbary Coast, in order to njoy free commerce within the Mediterranean area. When the 1778 American alliance with France was signed, American vessels were protected by the French Navy from “violence, insults, attacks, or depredations” by the Barbary Pirates. After the Revolution, American vessels no longer had the protection of the French or British and thus became subject to pirate attacks, which involved capture of ships and crews followed by demands for ransom. Presidents Washington and Adams were willing to pay tribute to the Barbary states on the grounds that it was cheaper to pay ransoms than to conduct wars against those nations. When Thomas Jefferson was minister to France and later Secretary of State, he expressed objections to paying ransom. Nevertheless, the United States paid almost one million dollars to gain the return of sailors from Algiers in 1795. Toward the end of his first term Jefferson dispatched additional ships under Navy Commodore Edward Preble to the Mediterranean. 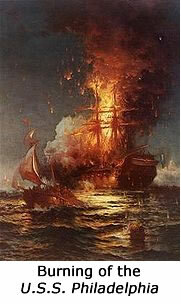 Lt. Stephen Decatur dispatched a raining party to set fire to the frigate U.S.S. Philadelphia, which the Tripolitan pirates had captured. Mercenaries and Marines led by Lieutenant Presley O’Bannon marched overland from Egypt and captured the city of Derna in Tripoli. (The first line of the Marine Corps Hymn commemorates the event with the words, “To the shores of Tripoli.”) A strong naval blockade brought the war to an end. Although the United States could not defeat all the Barbary states, the show of force induced the North African nations to show greater respect for American rights. Nevertheless, the United States continued to pay tribute to the other Barbary states until 1816, when Captain Decatur defeated the Dey of Algiers with a 10-ship American squadron. American prestige was on the line during those wars and was defended. However, the notion of “Millions for defense, but not one cent for tribute” in the XYZ Affair did not ring true. Americans paid tribute to pirates for years. Hamilton’s death accelerated the decline of the Federalist Party down to 25%, which in turn diminished the need for Republican Party unity. Jefferson faced two major defections from his party. John Randolph of Roanoke was a brilliant but tough politician who led the “Tertium Quids” (the “third somethings”); they stood for pure republican ideals. They attracted attention when they attacked land grants in Georgia to companies that had earlier bribed the state legislature. A later legislature attempted to nullify these sales, but much of the land was already owned by innocent third parties who had contracted for it in good faith. The Marshall Supreme Court ruled in Fletcher v. Peck (1810) that the state legislature could not revoke a contract, even if it had been obtained under false pretenses. The ruling established the Court's right to nullify state laws if they violated the Constitution. The foreign slave trade was outlawed January 1, 1808, as permitted by the Constitution. However the law Congress passed did not end importation. Many slaves continued to be smuggled into the country; some estimates place the number of slaves that were illegally imported by 1860 at 50,000, or even higher. The Essex Junto. The first rumblings of secession in American history came from New England, and were associated with a group known as the “Essex Junto.” (The word “junto” generally refers to a self-selected group with a political agenda.) The “Essexmen,” as they were originally known, were a group of conservative public figures in Essex County, Massachusetts at the time of the American Revolution. They supported the revolution but were less than enthusiastic about the unlimited spread of democracy. They gravitated towards the Federalist Party and objected to Republican policies of Thomas Jefferson. Because the Louisiana Purchase would open up territory that was likely to become heavily Republican, the Essex group began to plan the creation of a Northern confederacy, which would secede from the Republican South. They quickly realized that the structure would have to include New York and New Jersey. They approached Vice-President Aaron Burr, who, as we have seen, was already in disfavor with Jefferson and was planning to run for governor of New York. Burr was sympathetic to the confederacy plan. When he lost the election for governor, however, plans for the confederacy dissipated. Remnants of that group, however, would resurface in 1814 and 1815 during the Hartford Convention, which will be discussed further below. “The history of the country between 1803 and 1812 is the story of attempts to keep both peace and dignity,” noted one historian, and it rings true. During the administrations of both Jefferson and Madison, America continued to be dominated by events in Europe. Diplomatic historian Thomas A. Bailey coined the phrase, “Europe's distresses spelled America’s successes,” but it worked the other way as well. America got whipped about by European turmoil, even while profiting from wars as a trading neutral. As has been suggested above, the United States was fortunate that the French Revolution did not start earlier than it did. Looking at it another way, it is fortunate that the Constitution was written and the government underway before the French Revolution began. The events of the French Revolution dominated world affairs and to a great extent American domestic politics from the outbreak of the Napoleonic wars in 1792 to the defeat of Napoleon at Waterloo in 1815. The full story of the French Revolution and Empire will not be repeated here, but suffice it to say that the American Revolution stirred passions far beyond the Anglo-American realm. For a time the French Revolution was seen as a successor event of the American Revolution. But the two revolutions were very different. The American Patriots never claimed that George III did not have the right to rule; they merely argued that he did not have the right to rule them. By stark contrast, King Louis XVI and his wife, Marie Antoinette, were executed, and instead of leading to the creation of a democratic republic, the French Revolution led to the autocratic rule of the Emperor Napoleon. 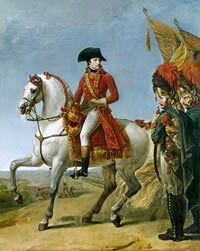 Napoleon Bonaparte was one of the most skillful and successful military commanders in the history of the world. His French armies overran most of Europe and penetrated deep into Russia before succumbing to the Russian army and the Russian winter in 1812. During the first decade of the 1800s, central and southern Europe were dominated by Napoleon, who declared himself Emperor of the French in 1804. His French army rolled over everything in its path during the wars of the French Empire, just as they had during the French revolutionary wars of the 1790s. While the French possessed a powerful navy, they were challenged at sea by the traditional naval might of the British Empire. The Royal Navy, led during that period by Lord Horatio Nelson, was well-nigh invincible on the seas. 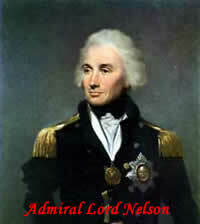 In the three great sea battles of Trafalgar, Copenhagen, and the Nile, Nelson crushed the Danish and French fleets and controlled the Atlantic and Mediterranean for most of the time when Napoleon was in power. Foreign Affairs under Jefferson. Napoleon resumed war against the allied nations in 1803, which created a dangerous situation, but left America free to pursue its own interests. American neutrality promised lucrative trade opportunities; there was no direct threat to American security from the fighting in Europe. In 1805 Napoleon triumphed on land at the Battle of Austerlitz. Lord Horatio Nelson defeated the French fleet decisively at the Battle of Trafalgar in the same year. Thus the contest became known as the struggle between the tiger and the shark. Although pro-British (Hamilton) and pro-French (Jefferson) sentiments had existed since the 1790s, Americans felt detached and aloof from the struggles until the problems escalated during Jefferson's second term. From 1795 to 1805 friendship with Great Britain prevailed despite incidents at sea. Further, the XYZ and Genet affairs were still fresh in American memory. Jefferson always went out of his way to avoid war, except when he saw it as the only solution, as with the Barbary pirates. He preferred what he called “peaceable coercions,” and commercial coercion, which was “peaceful,” could be an effective tool in international politics. America was the most important neutral in the conflict (as she would be in later wars.) During the struggle in Europe, American merchants were making huge profits on food and other goods from the highest volume of trade that had gone on in decades. For a time, the warring powers did little to interfere with neutral trade, but as a war grew more intense, that situation was bound to change. When Great Britain had gained mastery of the seas, it did. Great Britain, France, and Spain had long restricted trade between their colonies and the mother country to cargoes carried in their own ships. With their own merchant fleets hemmed in, France and Spain were happy to allow American ships to carry trade between the Caribbean and Europe. Under the British Rule of 1756, however, colonial ports not open in peacetime were not open to neutrals in time of war—British peacetime rules still applied. When it became apparent that American trade was in fact aiding the French cause, the British objected. For American merchantmen, however, a loophole existed. American vessels were free to carry goods between European colonial ports and the American homeland. When Great Britain sought to restrict trade between French colonies in Europe, Americans resorted to what was called the “broken voyage.” They brought goods from British and French colonies to the American ports, then reshipped them as U.S. goods. Legally the goods had to be actually imported before being reshipped, but whether they were in fact imported was hard to prove. In 1800 the U.S.S. Polly brought Cuban sugar to Massachusetts, then shipped it to Spain. The British determined that importation and reshipment in such a manner was a broken voyage and thus acceptable. But in 1805, according to the Essexruling, the mere payment of import duties did not constitute evidence of good faith importation. The British demanded more proof that the goods were in fact imported. If the ship put into port in the U.S., it had to demonstrate that the goods did not make a continuous voyage. It was difficult to prove a negative. In 1806 Congress passed an act adopting non-importation of certain goods from Great Britain as retaliation for Great Britain’s interference with American neutral rights. Great Britain in turn proclaimed a blockade from the Elbe River to Brest. Jefferson sent William Pinckney, a Maryland lawyer, to join James Monroe, the American ambassador to Great Britain, to try to work out a new treaty to replace Jay's Treaty, which was about to expire. The two ministers were able to gain some concessions from the British, who were concerned about the non-importation act. Jefferson vetoed the treaty, however, because it did not contain a clause on British impressment of American sailors (see below). British ships continued to hover off the American coast, capturing violating merchantmen and sending them to Nova Scotia. Many American ships were seized after the Essex ruling. The game got rougher as H.M.S. Leander “accidentally” hit a U.S. ship, killed first mate John Pierce, whose body was paraded around New York City to a great hue and cry. As a neutral nation, the United States sought to continue its trade and commerce with the rest of the world even as the warring nations began to place restrictions on neutral traffic. French and British sea captains preyed upon American shipping, and although both were viewed in essentially the same light by the American government, the fact that Great Britain dominated the seas made her depredations more troublesome than those of the French. Furthermore, since the British depended so heavily upon sea power for survival, they faced constant pressure to keep fleets well manned. This task was difficult task because life in the Royal Navy was known to be harsh and demanding, and British sailors were prone to desert their ships whenever an opportunity presented itself. There were few volunteers in the Royal Navy. Ships would spend months at sea and years away from home. The food and quarters aboard ship were unpleasant, as both could be infested with vermin. Discipline was administered with the lash or by keel-hauling. Press gangs were employed to “recruit” sailors from the slums of British cities, especially in time of war, when desertions ran high. This tactic had been in use for over 400 years to keep Royal Navy ships adequately manned. At one point, twelve British ships were stuck in Norfolk because of desertions—there had been 42,000 desertions in the Royal Navy by 1801. American merchants, always looking for experienced sailors for their crews often encouraged British sailors to desert to the American merchant fleet. Americans were building 70,000 tons of shipping each year and needed 4,200 new sailors per year until 1808 to man merchant vessels. The result was that the press gangs, who forced reluctant young men into the Royal Navy with impunity, began to point the finger at deserted British sailors serving in American vessels. Royal Navy cruisers began stopping American ships and “impressing” sailors identified as deserters back into His Majesty’s service. The fact that some of those sailors might have become American citizens, or in fact had not actually deserted at all, made little difference to the press gangs. Times were desperate, and desperate measures were called for. Although American merchant ships lost many sailors to impressment, British deserters were plentiful enough to make up for those losses. Despite American protests, the British operated at will on the seas, and hundreds of American seamen were impressed. The British violated even their own rules when they got desperate enough. Some 8,000 bona fide U.S. citizens were eventually taken by force, which hurt shipping interests, merchants and families. Impressment was seen by Americans as a violation of their neutral rights; the British promised not to take American citizens. The British idea of citizenship, however, was not the same as the American view: “Once an Englishman, always an Englishman” was their motto, and that was especially true in time of war. Americans resisted, but they were not innocent in the matter—they encouraged desertions through enticements and sold phony citizenship papers. They also advertised for sailors in neutral ports, promising higher wages and better treatment. American protests produced some releases, but it took time. The U.S. claimed that the American flag created de facto American territory and called British practices “nautical slavery,” but impressment continued. Berlin and Milan Decrees. In 1806 Napoleon issued his Berlin Decree, thereby instituting what was known as his “Continental System.” The Decree prohibited the import of British goods to any nation in Europe allied with France. Any ship that followed British trade rules was deemed to be a British ship and was therefore a legitimate target of the French Navy, which left American ships’ captains between a rock and a hard place. French privateers felt free to capture any ship which the British had searched. In 1807 Napoleon issued the Milan Decree to enforce the Berlin decree. The two acts constituted open economic warfare against Great Britain. When the British ruled in 1807 that ships bound for Europe had to stop and move their cargoes through England, France declared that all such goods were British property and seized them accordingly. As America was the most important neutral nation, American ships were directly affected. The restrictions emanating from both France and Great Britain inevitably rendered cargoes that did manage to evade the blockaders more valuable than ever, with predictable results. The impressment controversy continued more or less unabated until 1807, when the British went too far. The captain of H.M.S. Leopard, prowling off the American coast, after exchanging apparently respectful signals with the American warship U.S.S. Chesapeake, demanded the right to come aboard and search for deserters. When American Captain Barron refused, the British opened fire, killing three Americans and wounding eighteen. Four American seamen were taken off the Chesapeake, and one deserter was hanged. Although the British acknowledged their error, Americans were outraged. Ten days after incident President Jefferson closed all American ports to the Royal Navy, and Congress authorized the construction of 263 gunboats. Jefferson was unwilling to go to war over the issue, but demanded an apology and reparations, which the British duly offered. In order to avert further confrontations, President Jefferson then ordered Congress to put an end to all foreign trade with the 1807 Embargo Act, which legally ended all trade by American ships overseas in December 1807. Despite the fact that during the ongoing conflict merchants were being harassed by both the British and French, the wartime situation had driven prices of goods up to such an extent that merchants could make a tidy profit even if some of their ships were captured. The Embargo was a strict act; when loopholes appeared, Congress did its best to plug them. Nevertheless, the same Yankee ingenuity that had foiled the British before the revolution was used to get around the embargo. Trade across the Canadian border took up some of the slack. Also, as inter-coastal trade was still legal, some ship owners used that fact as a ploy to get their vessels out of port. Because of the Embargo’s impact on their livelihood, New England revolted against the Embargo, calling it the “dambargo,” or the “ograbme” (embargo spelled backwards.) Federalists said the Embargo was like cutting off your head to stop a nosebleed. The New England shipping industry was badly affected and grass began to grow in the streets of towns like New Bedford, Massachusetts. There the matter rested as Jefferson's prepared to turn the presidential office over to his hand-picked successor, Secretary of State James Madison. The Embargo was repealed just as Jefferson left office in March, 1809. The Embargo did have some unintended fortunate results, however; it drove capital and labor from agriculture or trading into manufacturing, rendering the United States less dependent upon imports of foreign manufactured goods. The lack of trading also relieved the impressment crisis and bought time for America to grow stronger. James Madison responded to criticism of the embargo by arguing that the Embargo was a positive instrument of policy, not a backing down in the face of British pressure. The Act also led to the eventual British repeal their Orders in Council of 1793, which had authorized the seizure of American ships and cargoes. The end of Jefferson's two terms left the country much larger because of the Louisiana Purchase, but in other respects scarcely better off than in 1800. True, the Republican victory in 1800 had the effect of diffusing some of the political antagonism that characterized the 1790s, but Jefferson proved that he could be just as partisan as his predecessor Adams had been, despite the lofty words of his first inaugural address. Jefferson's ideals were high, but like many other presidents and rulers before and after, he found it difficult to live up to those ideals once in power. Jefferson did not want to be remembered on his gravestone for anything he accomplished during his eight years in the White House, and that is probably an accurate judgment. Jefferson is on Mt. Rushmore, and no doubt deserves to be, but more for his thinking and intellectual leadership than for his governance. In any case, he passed a healthy if somewhat impotent nation along to his successor, his friend James Madison.